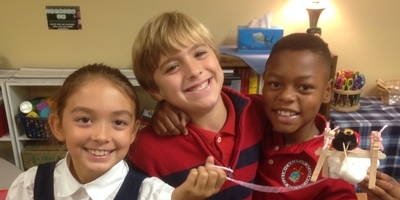 Christian Academy’s elementary curriculum is designed in alignment with the school’s mission to provide academic excellence in a Christ-centered environment. Curriculum is comprehensive in scope and is carefully sequenced to support the development of the individual gifts and talents of students as they grow spiritually, intellectually, emotionally, socially and physically. Teachers provide appropriate challenge and support as they create a nurturing environment in which children can thrive. Communication skills are valued as students read, write and are given opportunities to work with one another to problem solve, analyze and share the conclusions they draw throughout the school year. Hands on opportunities for exploration and design are integrated throughout the curriculum in keeping with the school’s STEM initiatives, challenging students to develop their higher level thinking skills. Foundational to all aspects of curriculum is the daily study of God’s Word, as well as integration of biblical principles throughout each subject. This allows students to study God’s creation through the lens of His Word. Core academic subjects include Bible, Language Arts, Math, Social Studies and Science. Related arts include weekly or bi-weekly classes in the areas of technology, Spanish, music, art and physical education. Multiple co-curricular activities such as Robotics, Drama, Chess, Math Meet, Geo Bee and Battle of the Books also support the total elementary curriculum and enhance the students’ opportunities to explore, develop and celebrate their gifts and talents.